Vareniki – are dumplings, stuffed with savoury or sweet filling. It’s considered that vareniki is a traditional Ukrainian dish, but originally it came from Turkey. It was a dish made from boiled unleavened dough with meat and vegetables filling. When “Vareniki” appeared in Ukraine for the first time, they were called ‘diush-var’. The Ukrainian people liked this dish so much that these dumplings quickly spread over the Ukraine and beyond, and became widely-popular, turned into traditional Ukrainian cuisine and began to call as ‘vareniki, and this name simply means – boiled. Ukrainian savoury vareniki are usually topped with shkvarki – fried salted pork fat, and also can be topped with fried onions or just accompanied with sour cream according to local taste or preferences (i.e. last two toppings are quite popular in Russia). The most popular fillings are potatoes, mushrooms or fish. Vareniki could be also made sweet, with cherries or sweet cottage cheese filling. There are many recipes of vareniki nowadays, with egg or sour cream in dough, based on water or kefir. My recipe is the simplest one, and I used a mix of mashed potatoes and mushrooms. You can use the same dough for sweet fillings, such as cherries or black currant. Here is the short video how I make these lovely twisted edges of the Vareniki. Vareniki can be frozen well, that’s why I usually make a big batch, put them in ziplocks and freeze! No need to defrost before cooking. Dissolve salt in warm water. On a flat surface make a well in the flour, add egg and salted water. Knead until the dough is pliable. Cover with plastic wrap or towel and let rest for 20 minutes. Meanwhile, saute onion and mushrooms in oil and butter. In a bowl combine mashed potatoes with vegetables and dill. Season to taste. The filling is ready. Roll the dough into 8cm/3-inch circles, place 1 tsp potato mixture into center, fold the dough over filling and press it. Bring a large pot of salted water to boil (salt the water as for pasta or you like). Put vareniki into water and carefully stir with a spoon. When they come to the surface – cook for 4-5 minutes more. 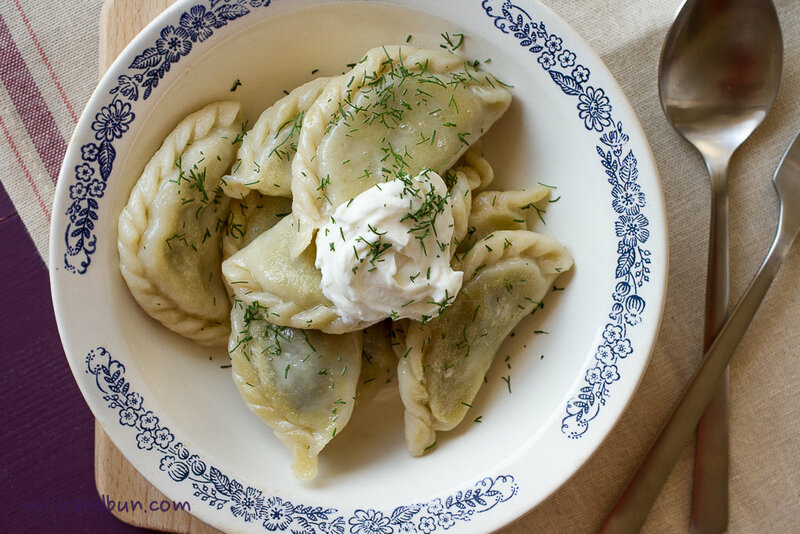 Serve vareniki with sour cream, chopped dill and a knob of butter on top. You can brown vareniki a bit in a butter straight after the boiling. Serve with sour cream, but already without extra butter on top. Apr4April 4, 2014 • By milkandbun • This entry was posted in Russian cuisine and tagged blog, cooking, dinner, DIY, dumplings, Fiesta Friday, food, food and recipes, food photo, food recipe, foodie, foodpress, lunch, main dish, photo, photos, potato, recipe, recipes, Russian dumplings, Russian recipe, Russian tradition, Ukrainian, vareniki, video. Bookmark the permalink. I love dumplings I have to try your recipe they look so delicious, Could these be fried as well? Thank you, Suzanne! You can fry them only after boiling, if you like. Your dumplings look delicious! It appears you’re a pro at sealing them too – the edges are beautiful 🙂 Your choice of ingredients with these sounds great, I bet that bit of dill really punches up the flavor! Thanks for sharing this incredible recipe! That’s so nice to hear! 🙂 Which else Ukrainian dishes have you tried or liked? My mother-in-law makes wonderful borscht with ushka too. We eat the multi-multi-course meal on Christmas Eve- such a lovely tradition. I love vareniki, but have never made them myself. I’m sure home-made ones will be even better than the store-bought ones, which can be a little bland. A great recipe for me to try out on one of these rainy spring days. Thanks. I’m glad you liked my post, Hilda! Homemade dumplings are definitely more tastier! These dumplings look delicious, Mila! I would be willing to try the recipe! Thank you so much for the reblogging, Susan! Oh, this looks very nice! beautifully folded edges! I love dumpling, so I’ll try Vereniki! Do you eat them like pasta just as it is with this sauce? Or do you usually eat with other thing (fish or meat etc..) as side dish? Thank you for your comment and questions! We eat them as a main dish for lunch or dinner (like ravioli); a sour cream comes as sauce here, or you can saute some extra onion and garnish with it as well. These looks sooo amazing! Beautiful how you put them together, wow! And such gorgeous photos too! Thanks for sharing! Great video, Mila! I also love your photography! Those dumplings look so good. Yum! These do sound delectable to every palate! Thank you for sharing! You made some stunning dumpling there! Such a lovely recipe and presentation! I love dumplings, It’s so interesting to see all the delicious variations of this wonderful dish. You are very welcome! They are gorgeous! Mila, this post is fantastic and the video even better. I love your dumplings and I think I’m going to surprise a couple of Russian friends next time I’m cooking for them. Great, great recipe!!! Thanks for sharing the background for these dumplings. They look delicious! Mila! I love your video and cannot wait to try to make vareniki myself. Your technique is so fun and I can already taste that luscious potato filling just looking at those pictures. Thank you for sharing this recipe with us! I’m flattered by your words! 😀 Thank you so much! I’m so happy, that the video is interesting and helpful! Oh yes, it only looks complicated but easy to make! 🙂 Thank you so much for the comment! I love your video!!! The filling looks delicious. I have never heard of these but they sound so delicious! I love learning about new cuisines! I’m going to have to try making these sometime! Thanks for sharing! Beautiful blog as well. I cannot believe I missed this post… how come??? Btw your varenki seem really tasting and the shape is beautiful! No worries 🙂 Thank you for the kind comment, Margherita! Dear Mila, I am so on this one! I can sincerely say that my favorite “ethnic” food is Eastern European . . . I know that is a big umbrella but I adore all foods Polish, German, Russian. Your video was so helpful and kind of inspired me to try making a video. Finally, I am so glad I found your blog, I love the name of it and your logo, and look forward to making lots of Russian goodies. But hey, that all-American cherry pie looks pretty darn fabulous too. Never tried it with leeks and even never seen such recipe on the Internet.. Is it only leeks? Or mixed with something else?